The Festina Group consolidates its relationship with the current Festina brand ambassador Gerard Butler, renewing the collaboration with him for an additional three years. The renewal follows on from the success of the first brand campaign shot in Hollywood, in which the Scottish actor shared his different passions in life. Butler’s international profile as well as his professionalism and talent confirm him to be the perfect candidate to embody the values of the watch brand. 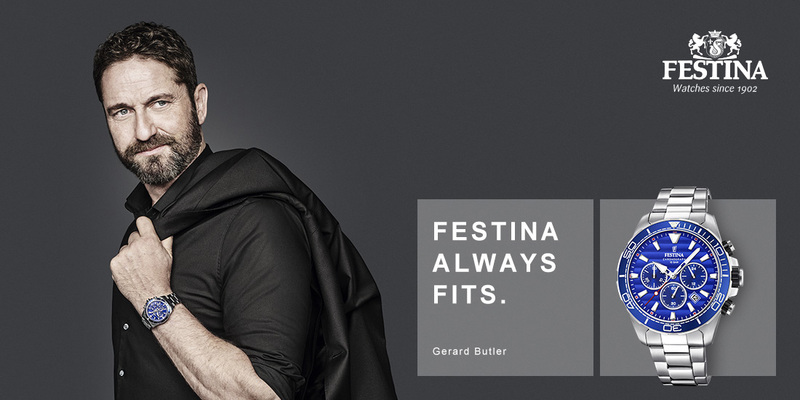 On this occasion, the Festina ‘Always Fits’ campaign presents Gerard Butler at his most seductive and spontaneous, full of charm and charisma. The three part campaign, united by a subtle common thread, highlights the versatility of Festina watches and their famous ambassador, both perfectly adaptable to any situation or circumstance, without losing an ounce of their characteristic style or elegance. Festina gives the public the opportunity to see the actor in different situations, each showing him with his usual wit and irony and there is even the opportunity to see him dance to the beat of the most unexpected rhythms. Under the control of director Albert Uria the filming of the different campaign ads took place in a relaxed atmosphere in different picturesque locations including the emblematic house known as La Ricarda, an example of rationalist architecture, located a few meters from the Mediterranean Sea. Marcel Hartmann also participated in this production as the photographer of the ad campaign. Stars that have passed in front of his lens include Kate Winslet and Monica Belucci. Hartmann also enjoys the responsibility of being in charge of photographing the Cannes film Festival. The two-time Emmy winning make-up artist Allyson Carey also participated in the project. The Festina ‘Always Fits’ campaign will be presented officially next March during the second edition of the Festina Group Trade Show, a corporate event that reunites distributors and clients to be celebrated at the iconic Four Seasons Hotel Ritz in Lisbon.